Welcome to BrookPro Investor™, a comprehensive and easy-to-use software application developed specifically for real estate investors like you. Whether you are wholesaling, rehabbing, lease-optioning, short-selling or buying and holding, BrookPro Investor™ is YOUR system. As a national leader in the rehab business, Brookview understands the importance of "systems" to organize, control and grow your business. Investing in "systems" is one of the most important investments any company can make. That's how we built our business, and that's how you will build yours. For a limited time, BrookPro Investor™ will be offered to Platinum Members for FREE! Yes, that's right, FREE. This is your Club and this is your Software. Use it, experiment with it and let us know what else you'd like to see. But don't wait too long to join, as this promotion will not last forever. BrookPro Investor™ is built to organize and grow your business life, so you will have more time for your personal life. Built on a Microsoft platform, a scaled down version of what Brookview uses to manage its own business, BrookPro Investor™ allows you to manage all your Daily Activities from an easy-to-use Dashboard. Detailed and time consuming tasks are just a click away. Manage marketing campaigns and lead generation as well as deal analysis, offers on prospective properties and rehab budgets. Plus you get customized workflows, property management, accounting and so much more. When we say comprehensive, we mean it. BrookPro Investor™ allows you to create, implement and manage your marketing campaigns to have the phone ringing with leads. As the saying goes, "You can't manage what you can't measure!" Build your campaigns, track the results and invest your resources in campaigns that work best. You also will love our preloaded scripts and the mass email functions. The success of your business is often a function of the number of offers you make. But the number of offers you make, is often a function of how many Prospects you can manage at one time. Managing your Prospect Pipeline is critical. One of the biggest challenges we see in the investor community is that real estate investors will sometimes try to "force" a bad deal. This happens in part because they don't have enough alternative prospects working. If it is a bad deal, move on. If the price is too high, schedule a tickler to renegotiate. Yes, it can be challenging to manage multiple prospects. But with BrookPro Investor™ you can keep track of deal analysis, offers and counter offers, repairs, budgets, photos, contacts and more, all by specific prospect property. Manage numerous Prospects simultaneously, keep your pipeline full and make offers on only the best deals at the best prices. BrookPro Investor™ includes a built-in Deal Analyzer that will help you calculate your profit on each deal and make smart offers. Over the years, Brookview has reviewed tens of thousands of deals for our borrowers, and many times investors have brought us deals that did not work… for THEM. Yes, we saved investors from making a financial mistake, but you can do this too. BrookPro Investor™ is build specifically for rehab investors, and includes detailed profit analysis, repair budgets, holding costs and offer calculations, so you know your numbers going in. Invaluable! BrookPro Investor™ has the ability to break down any repeated process into a series of manageable steps and sequences. For example, if you are negotiating short-sales or rehabbing houses, certain tasks need to be done in certain order and within certain timelines. BrookPro Investor™ helps you manage these tasks and is fully customizable. What's more, the system comes preprogrammed with some of the more common Work Flow Modules, such as short-selling, wholesaling, assigning contracts, closings, hiring contractors, lease optioning, leasing, listing properties, and sending email blasts. What's exciting about the built-in contact management system is that it allows you to organize all your contacts by property and groups. Contacts can be coded for each specific marketing campaign, prospect, and property, or any other customized subgroup. For example, you can generate a list of all contractors on a specific property, and search for a carpenter in a particular area. Or customize a mass email to your Buyers List, and much more. BrookPro Investor™ allows you to keep track of all your income and expenses by property, create invoices and bills, and set up automatic reminders for payments and late fees. Never miss a payment, and collect your rents on time. 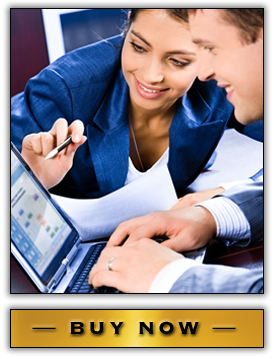 Have at your fingertips the key reports you need to manage your business. At the click of your mouse, you will see your P&L Activity, Cash Flow, Property Pipeline, Vacancies, A/R Aging, Expiring Leases, Properties for Sale, and much more. BrookPro Investor™ helps you keep track of all mortgage loan information associated with each property, include specific loan terms such as rate, payment schedule, lien position and fees. It also allows you to save and attach the specific loan documents to each property record. Truly paperless! BrookPro Investor™ can create and save as a template any contract or document that you use repeatedly. While document templates are fully customizable, BrookPro Investor™ comes preprogrammed with everyday templates, including Offer, Purchase Agreement, Tenant Lease Agreement, Property Management Agreement and Wholesaler Assignment Contracts. Use the preloaded templates to create documents, attach them to the specific property, and save countless hours of your valuable time. At the end of the day time is our most valuable asset! BrookPro WebBuilder™ - ADDED BONUS!!! Having your own website is a must for any business. It is your calling card to the world. Included for a limited time with the BrookPro Investor™ software is a preprogrammed website builder. Choose from multiple design looks and fully prepared text, so you can be up and running in no time. BrookPro WebBuilder™ is also fully customizable, with the ability to add pages, pictures, properties and so on. We will also include the hosting fee in your Platinum Membership. Click here for more information. If you are a wholesaler or retailer, imagine having well-organized marketing campaigns that bring you tons of leads. Use the preprogrammed scripts to filter those leads and develop a Prospect Pipeline using the Prospect Manager. Then imagine being able to analyze the deal using your built-in Deal Analyzer and quickly manage the response to your prospects. Produce your detailed Repair Budgets right in the system. If the deal is attractive, imagine Making an Offer on the property with the push of a few buttons from your preprogrammed Offer Template. Track these offers and counter offers and let the system help you manage the negotiations. Once you have the property under contract, if you are a Wholesaler, imagine preparing your Offering Package to Potential Buyers List using a preprogrammed template. Then with the push of a bottom, have the Offering Package sent to your stored potential Buyer List electronically right from your computer. Create the contract assignment automatically too, through the BrookPro Investor™ merge functions. Retailers, you get all the benefits wholesalers do in developing and managing marketing campaigns and lead generation, as well as deal analysis. 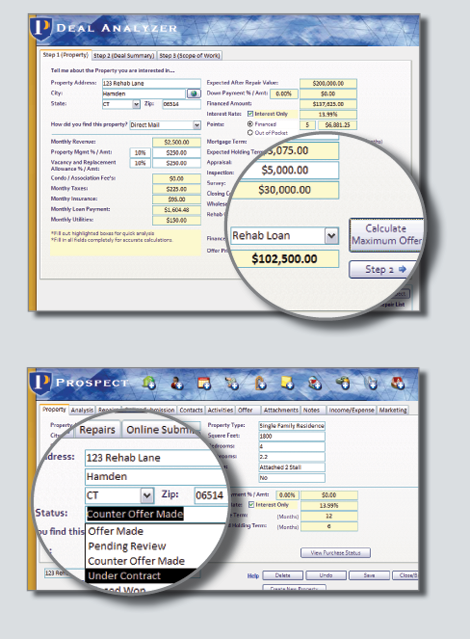 But you will also be able to track the rehab process with precision using the detailed budgets and work flow templates. You can also manage the sale process after the project is complete, or benefit from the property management module should you decide to hold for cash flow. So now how many deals to you think you can do?